Why I Live in Minnesota | So Many Exciting and Beautiful Places! We hadn’t been “Up North” for over a year, so decided to head to the family cabin near Crane Lake, not more than 10 miles from the Canadian border. On the way, we stopped at a spot near our home to see a clump of lady slipper flowers that’s been blooming there each spring for several years. 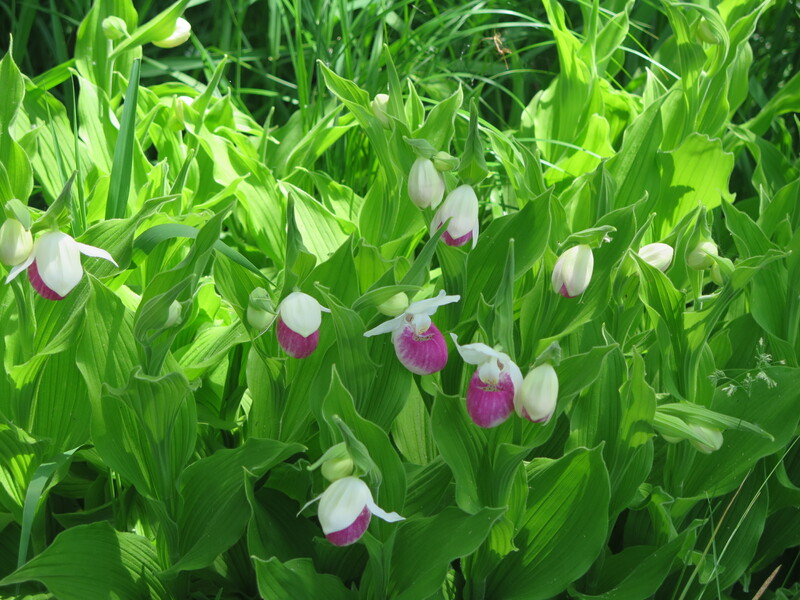 This is the Showy Lady Slipper, the official Minnesota state flower. We make it a point to check them out each year, hardly believing that they grow so near to our home. We arrived at the cabin around dinner time, and were able to witness an amazing sunset. Smoke from Canadian wildfires is causing the sun to look red as it approaches the horizon. The weather up here is truly beautiful, mid-70’s and mostly clear skies. I took a long walk and regretted not bringing my camera along. Wild flowers are blooming everywhere, and trees and shrubs are showing their new spring growth. After dinner tonight, I did grab my camera to try to capture the sunset, and was rewarded with more than just a gorgeous view. A painted turtle was laying its eggs near the lake shore. There was evidence that other turtles had also laid eggs in the area. The next morning, I went back to the beach and found another turtle, this time a snapping turtle, also laying eggs. Unfortunately, there was evidence that the other turtle’s eggs had been dug up, probably by some type of weasel. We know that there are pine martens on the property. They love eggs, and have even grabbed loon eggs out of the nests on the lake. After this turtle was finished, my husband and I tried to disguise the spot, but when we returned later, those eggs had been taken too. Snapping turtle. The small white orb near the tail is one of her eggs. The nest before it was robbed. The eggs have been dug up by a weasel. Today, I brought my camera on my walk. Northern Minnesota is so beautiful, especially at this time of year. Later in the day, I heard a bird hit one of the windows. It was a woodpecker, and it was still alive, although on its back and flapping its wings. I went outside and it was lying still as if dead, but I could see that it was breathing. After giving it a nudge, it flipped over, shook its head a few times and later took off. Poor thing probably had a throbbing headache. We head back tomorrow. It was a lovely weekend. This entry was posted in Minnesota, USA Travel and tagged Minnesota, Showy Lady Slipper. Bookmark the permalink. You saved the woodpecker – very cool!